It’s Long Shadows month in the northern hemisphere, meaning maximal daylight hours to entice you onto a nearby trail for exploration and adventure. Or maybe you’re tackling a not-so-close-to-home trail? Even better! Drop me a line and tell me all about it! Let’s face it. Our lives are busy. Our schedules are full. The choice between getting outdoors and our family/work obligations can become lopsided. But the thing to remember is that one conscious decision to do one thing differently can make all the difference in the world. Natural Red is a good example of blending the important things (like outdoor time and favorite recipes) and coming up a winner. Hiking-For-Her’s Question: Can you pinpoint what shifted within you to start your life on a different, more active and healthy, trajectory? Karen’s Answer: "About 10 years ago my mother was diagnosed with a terminal illness. I was her primary caregiver along with working fulltime and caring for my own family. It was a lot to handle and eating is what I have always done when stress was high in my life." "I was in my early thirties and started experiencing chest pain while sitting doing nothing one afternoon. I made a visit to my doctor and she explained it was stress related and with my weight being so high it was a road to disaster." "I knew this, obviously, so that day I decided to find something else to relieve my stress instead of eating. I chose exercise. However, being much heavier than I am now, it was a slow and miserable road to get to where I am today." "I was very lucky and saw results very quickly or I don't know if I would have stuck with it. My initial goal was to lose 20 pounds but that was so easily achieved that I just kept losing until my body stopped naturally. I have maintained that new weight within 10 pounds now for over 10 years." "Today I love exercise, love the outdoors, and very rarely miss a day with at least some type of physical exercise involved. I have tried so many different things and have learned so much about myself through this journey." 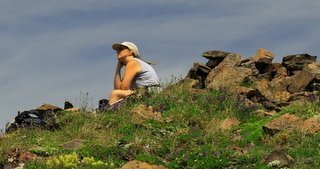 Hiking-For-Her Q: Baby steps don’t seem like your style, but what advice/encouragement can you offer to women who aren’t currently active but would like to be? "I am not an outgoing person by any means, but I am so thankful I finally made this change in my life before it was too late to try and enjoy new things. I would encourage any woman who is thinking about making a change to a more active lifestyle to just jump in and do it! Don't worry about what others think, say or do. This is about you and you only." "If you find you just can't do it alone, find a friend, your spouse, a partner or join a group in your nearby area to do it with them." "I am not a person that can think a long time about trying something new because then I will have too much time to over analyze it and talk myself out of trying it. I just do it and do it quick." Hiking-For-Her Q: What’s on your hiking bucket list? "My hiking bucket list is not very long. I am more of a day hiker so I have no hope of ever doing a “many miles” hiking trip for days on end. Although, that being said, I do have a hope of hiking a few areas. Eventually, I wish to hike a 9 mile trail called Chapel Loop near Pictured Rocks National Lake Shore in Michigan." "I also wish to hike Bryce Canyon National Park in Utah. I have fallen in love with the Southwest area of the United States since we hiked Zion National Park for our 20th anniversary. So right now we are planning a trip out to Sedona, AZ and hiking as many trails there as we can before we need to travel back home." "And for my last hiking bucket list adventure, I would someday like to summit a mountain. But this goal will be one that I am not sure I will ever accomplish simply because I have not been able to pick a favorite mountain to summit yet :)"
*Don't wait for a "postcard" from your heart before starting in on your hiking bucket list. *Jump right in, at your own pace. *Don't let anyone stop you from putting your body into motion. *Stronger body = happier person. Bright Lights – No Big City! Ever ponder the timing of your internal clock? It’s set by your exposure to natural light, and can be re-set in an unfavorable way by overexposure to artificial light sources such as flickering screens and night lights. And the Solstice (June 21) is an appropriate time to ponder your relationship to light, don't you agree? Watch this "Entrainment of the Human Circadian Clock to the Natural Light-Dark Cycle"
And then use it as motivation to plan your own “getaway exposure to natural light”. Just tell your friends it’s a camping trip! What could be more motivating than a stronger body and better sleep cycles? Make time for yourself AND a trail this month. Everyone in your life will be better for it. I'd love to hear what you did for your hiking self - drop me a line! And don't forget to repeat after me: "A bad day on the trail beats a good day indoors every time."